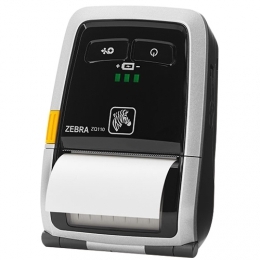 The Zebra ZQ110 is the smallest mobile direct thermal printer in the Zebra portfolio. Use it in retail, for public authorities, in the hospitality industry and in additional applications requiring small receipts with a maximum width of 50 mm. Compatible with all common mobile operating systems, you connect the printer, depending on the variant, wirelessly via Bluetooth 3.0 or Wi-Fi 802.11 b/g/n 2.4 GHz, as well as USB. Models with an integrated magnetic card reader are optionally available. Print at 203 dpi and a maximum speed of 90 mm per second. Thanks to the tear-off edge users easily remove the receipts. The printer features 5 LEDs which provide current status information, as well as a fixed sensor for the media level. The battery power of 1,200 mAh easily lasts for an entire shift. Compact measurements of 37.1 x 80.1 x 118.8 mm and only 229 g in weight allow the ZQ110 to easily disappear into your pants pocket for transportation. It also withstands falls from heights of 1.2 m. A separately-available protective cover gives the ZQ110 IP54 protection.